Readers tend to think that the title of this piece of a nonsequitur. Trees by their very nature, roots and all, can’t travel anywhere. As I explained in my novel Willow Switch, the giant willows of my youth did, indeed, travel. For mere utilitarian purposes, when my grandfather and great-grandfather left Ohio in the late 1870s, my grandfather a youth of fourteen cut willow branches from the tree in their front yard. The willow switches were used to keep their oxen moving by a well-placed whack on the flank. Dry branches would break, so the men kept the switches supple by placing them in the water barrel on the wagon’s side—one barrel for drinking water, one for switches. As plants are wont to do, in the course of the long journey, the switches grew tiny red roots that later wound their way toward the bottom of the barrel. In the two years it took for their journey, the saplings were pretty robust by the time they reached their destination. Eastern Colorado as I’ve stated before is far removed from a green oasis. Along dry creek beds, cottonwood trees grow where enough underground water exists to support them, but non-native species are difficult to start and even more impossible to grow to maturity. 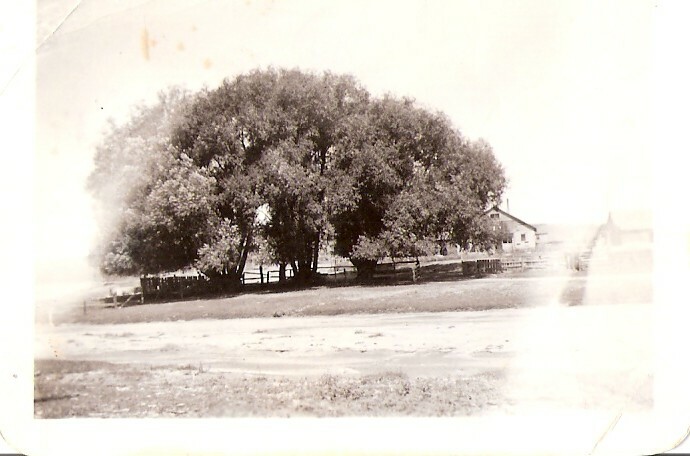 Elijah and Charles Monroe, my ancestors discovered that digging holes about sixty yards from the dry creek bed yielded moist earth for the saplings to establish themselves. That’s how the traveling willow trees came to be over 100 feet high by the time I was ready to climb them. 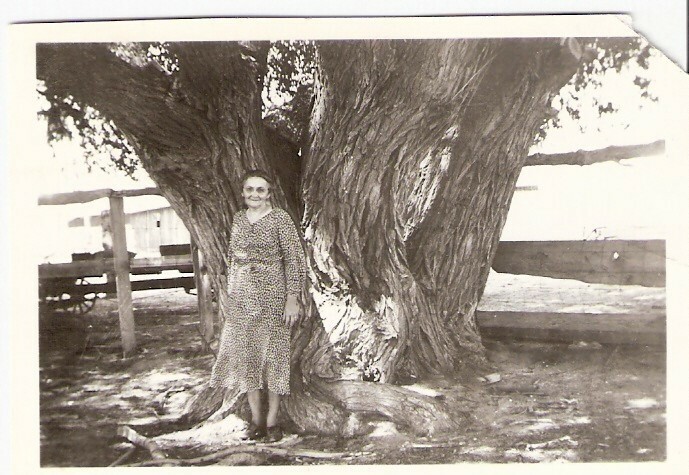 Photo attached is my maternal grandmother under my favorite tree. The thought of willow switches brings old-fashioned corporal punishment to mind. More than a few old-timers have told stories of getting a “switching” for an act of defiance or disobedience. Most children of the early 20th century were told to “go get a switch” by some higher authority before becoming the recipient of punishment. More than a few one-room schoolteachers kept willow switches handy for discipline purposes. My favorite willow had a wide gap approximately three feet up and then a perfect notch three feet higher for a lovely summer afternoon playhouse. No extra wood was necessary. The added attraction on this tree was a long dead but still supple branch which was perfect for hopping on and riding off into the imaginary sunset. A far better choice than the real horse that occasionally had a mind of his own. I spent my summers in those trees. When my mother insisted I take piano lessons I told her I would rather climb trees than practice and I’ve never regretted that decision for even a minute. Summer meant skinned knees from the rough willow bark and occasional bruises from missing a step going up. I spent my summers in THE TREES and it was great. While I’m side tracked here I might as well put out one more blog on writing before tracking back to history. In my 30+ years of writing and teaching writing I’ve encountered many talented writers who tired of rejection slips and began selling door-to-door cosmetics or something similar. Each time I encountered these talented folks who fell by the side of the road, my heart fell into my toes. When questioned most of them would say they just couldn’t take it anymore. The rejection, the long hours with no reward, and the writer’s block seemed to freeze their ambition and talent. My word to them and you, if you are considering quitting is DON’T. Sit out the next round if you need to, but don’t quit. I tell folks I’m stupidly persistent. When I first started writing at the ripe old age of thirteen, my mother discovered a science fiction short story I’d scribbled on a Big Chief tablet. She demanded to know what “this” was and promptly burned it in the cook stove. That set me back a bit and coupled with an English professor in college who told me “You’ll never be a writer.” I was in my 30’s before I sat down to write a piece for publication. But in all that time, the desire to write was still burning inside me. Despite the fitful start, I’ve had thousands of articles and more that a few short stories published, because I just kept plugging along. I have seven published nonfiction books, five children’s coloring books, and four novels published. So my advice to the discourage writer—Don’t Quit. Like most writers, I have enough rejection slips to paper my laundry room wall, but I just keep going and so should you. And not a drop to drink. Despite the sight of tall prairie grasses brushing the underbellies of his men’s horses, he was accurate in his labeling. Once the early pioneers crossed the Missouri and Mississippi rivers, water was at a premium. Water barrels attached to the sides of wagons became a necessity. West of the great rivers, streams and minor rivers were far and few. Occasionally creek and river beds were a sandy expanse in summer, changing in mere minutes with the advent of a brief rain into raging torrents of water floating full grown, twenty-foot high cottonwood trees ahead of the sludgy, brown stream. In mere hours, the whole scenario would vanish leaving pockets of quick stand and gumbo mud behind. To westerners water was and is more valuable than gold and the fight for water rights from the 1800’s to the present is on-going. Westerners are now involved in a water rights grab akin to the Oklahoma Land Rush. Population explosions in towns and cities have taxed water supplies to the limit and now below ground aquifers with names like Laramie-Fox Hills, Denver, and Arapaho have become household words as land owners make decisions on whether to hold or sell their valuable water rights. This decision effects the agricultural/ranching base of the rural areas. Small and large reservoirs have assisted in solving an infinitesimal part of the dilemma, but water remains the largest obstacle in settling the West. All this will affect who has water to drink. You are currently browsing the Authorsandy's Weblog blog archives for August, 2013.